University of Toronto Press (Toronto, 2015). Harvard University Press (Cambridge, Massachusetts, 2015). 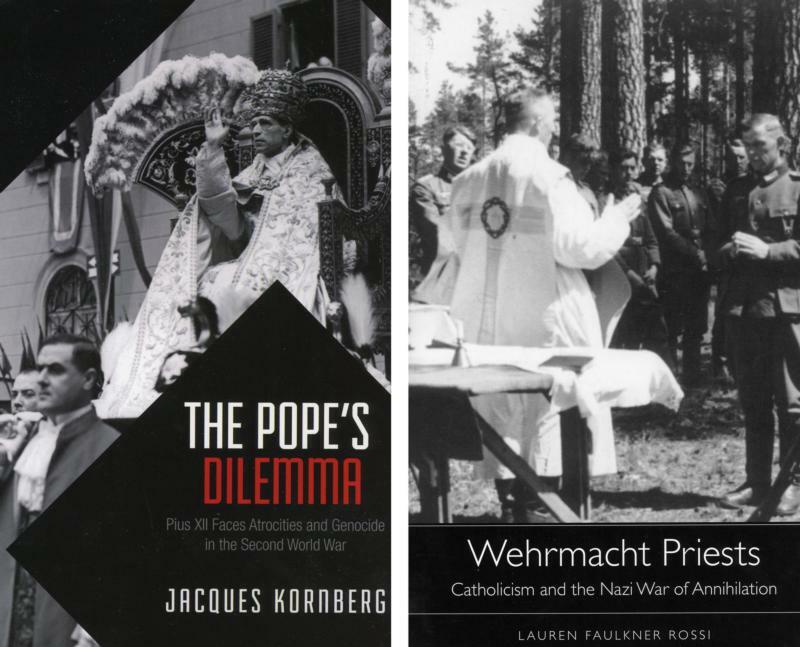 Seventy years after the end of the Second World War, two compelling new books reveal considerable nuances of Pope Pius XII’s and German Catholic clergy’s moral response to Nazi Germany. Lauren Faulker Rossi’s “Wehrmacht Priests: Catholicism and the Nazi War of Annihilation” uncovers the story of some 17,000 priests and seminarians who were conscripted into Hitler’s Wehrmacht between 1939 and 1945, while Jacques Kornberg delves into the very real dilemma also faced by Pope Pius XII: How to remain true to Catholic principles in the face of a regime whose values could only be described as anti-Christian and amoral. Read together, “Wehrmacht Priests” and “The Pope’s Dilemma: Pius XII Faces Atrocities and Genocide in the Second World War” are a cautionary tale about war’s challenges to morality. At first glance, it seems hard to understand how Catholic priests and seminarians could possibly square their commitment to Christianity with their service to murderous German nationalism. But as Rossi shows through her original study of their wartime letters, journals, reports, evaluations by military and religious superiors, and other postwar writings and interviews, most went to war willingly, believing that their spiritual duty required attending to the soldiers as military chaplains or medical workers. (Seminarians served in the general infantry.) The handful who resisted faced summary execution by a government eager to make them into examples (witness the special barracks for priests imprisoned at Dachau). One of the more interesting sections of Rossi’s book details her scrutiny of interviews conducted by the Catholic Military Bishop’s Office in Berlin with Wehrmacht priest-veterans some 40 years after the war. “Few” of these men “acknowledged the atrocities they witnessed or heard about, against Jews and non-Jews contemporaneously,” Rossi writes. As one military chaplain described his decision to join the Wehrmacht, “This was of course in certain ways a service to Adolf Hitler, but for our part, we didn’t think of it this way. The men should (be allowed to) maintain their faith in God, and despite all the difficulties through which they were living, find a foothold and remain unwavering” on their path. Rossi, a history professor at the University of Notre Dame, contributes substantially to Holocaust studies in this concise, appropriately critical and exhaustively researched book that will appeal to popular readers as well as academics. Elegantly written, “Wehrmacht Priests” is deeply thoughtful and engaging on every page. While German priests and seminarians were mostly blinded to the abhorrent nature of Nazism, Pope Pius XII was not. But, 70 years after the war’s end, many still wonder why he did not publicly condemn the Nazis for the Holocaust or at the very least castigate Catholic collaborators with the evil regime. Public opinion on the pope’s moral leadership during the Second World War has shifted from immediate postwar approval to (since the 1960s) excoriation. Yet Pope Paul VI (1963-78) originated the move to canonize Pius XII, which has won support from every subsequent pope (including the current Pope Francis). The time is right, then, for a reappraisal of Pius XII’s moral stance vis-a-vis Nazism, and Jacques Kornberg’s monumental “The Pope’s Dilemma” does not disappoint. Pius XII retreated from strongly and clearly denouncing Nazism for several reasons that Kornberg points out were deeply rooted in Catholic doctrines. For the pope, “religion trumped civic and political morality.” As head of the institutional church, Pius XII believed he was above all charged with maintaining its authority, to keep Catholics in the fold where they would have access to salvation. This stance was quite consistent with the response of earlier popes to wars (never publicly siding in conflicts to avoid losing the following of Catholics on either side) and to instances of atrocities that Kornberg discusses, including Benedict XV and the Armenian genocide and Pius XI and fascist Italy. It also dovetailed with Pius XII’s approach to five Catholic countries (Croatia, France, Hungary, Poland and Slovakia) during the war. Kornberg, professor emeritus of history at the University of Toronto, has given us an original and balanced analysis of Pius XII’s moral leadership that is as compelling as a novel. It will inspire much thought about dilemmas of church-state conflicts that we face in our increasingly war-struck world. Roberts is a journalism professor at the State University of New York at Albany who has written two books about Dorothy Day and the Catholic Worker.